There’s a new Cloverfield movie out, so obviously it’s time to talk about some of its mysteries and how all the films connect. Out of the blue, The Cloverfield Paradox was released on Netflix this past Sunday night. We’ve watched it (read our review here), and have been thinking about what happens in the film and how it links to 2008's Cloverfield and 2016's 10 Cloverfield Lane. If you watched it, odds are you’ve been thinking about that too. Only continue if you have seen, or don’t care about being spoiled on, The Cloverfield Paradox. Most of the connections between the films are pretty obvious, but let’s just run them down quickly. The bulk of them come from the title, The Cloverfield Paradox, which is also a fictional book in the movie written by author Mark Stambler, played by Donal Logue. Stambler is interviewed in the film and his answers explain that the particle accelerator being used by the heroes could damage the fabric of space-time. Firing it up could blend dimensions, unleash monsters, and do so not just in the present, but the past and future as well. With that one speech Stambler basically just explained the entire Cloverfield universe. Anything that happens in any of these films can, hypothetically, be tracked back to the particle accelerator in The Cloverfield Paradox going off (they should probably talk to Barry Allen). So how will zombie Nazis become a problem in Cloverfield 4? Space-time was ruptured back in the last movie. The film makes it clear that the accelerator blended dimensions (thanks to the introduction of Elizabeth Debicki’s character, Jensen) and we know that the Earth in Jensen’s alternate dimension is completely different from the one at the beginning of the film (because it’s at war, while the other one wasn’t). There’s also the implication that the main dimension, or at least the version we see at the end of the film, is under attack. What’s attacking it? Well, that’s a mystery saved for the film’s final shot. Yup, that shot. A monster, one that looks very much like the original Cloverfield monster, emerges from the clouds just as the surviving astronauts return to Earth. So we know that after the particle accelerator was set off, the Earth in The Cloverfield Paradox started to be attacked by at least one monster much like the first movie. When the new monster pops out of the clouds, the mystery of where the monster in the first Cloverfield came from is answered. It was unleashed by the events in The Cloverfield Paradox. The question then becomes, is this the exact same monster? We don’t know for sure, but probably not. The Paradox monster is obviously taller than the original monster, seeing as one towers over the clouds and the other didn’t even tower over buildings. The new one is also much broader. There’s also never a direct mention of when Paradox takes place, but the film’s ARG hints it’s about 10 years in the future, and the technology seen in the film backs that up. The first Cloverfield took place in 2008. That’s a two-decade difference. So it’s probably not the exact same monster, but some kind of related creature. We still have a whole other movie to consider: 10 Cloverfield Lane. That film was basically contained until the end when it was revealed aliens had invaded the planet. Watching The Cloverfield Paradox, my first thought was this new giant monster was one of those—but that doesn’t quite match up visually with the aliens in 10 Cloverfield Lane. Again, it’s possible Lane exists in another dimension. Except for the interesting revelation that the author in The Cloverfield Paradox shares a last name, Stambler, with John Goodman’s character in 10 Cloverfield Lane. Are they related? Plus, the newscaster he’s talking to, played by Suzanne Cryer, is played by the same actress who tries to break into Howard Stambler’s bunker in 10 Cloverfield Lane. That can’t be a coincidence, can it? Then, of course, there are plenty of little winks all over The Cloverfield Paradox. There’s a Slusho bobblehead, brands from the other films like Kelvin and Tagruato, and many visual links, such as the bunker (linking to 10 Cloverfield Lane) and burning urban vistas (linking to Cloverfield). 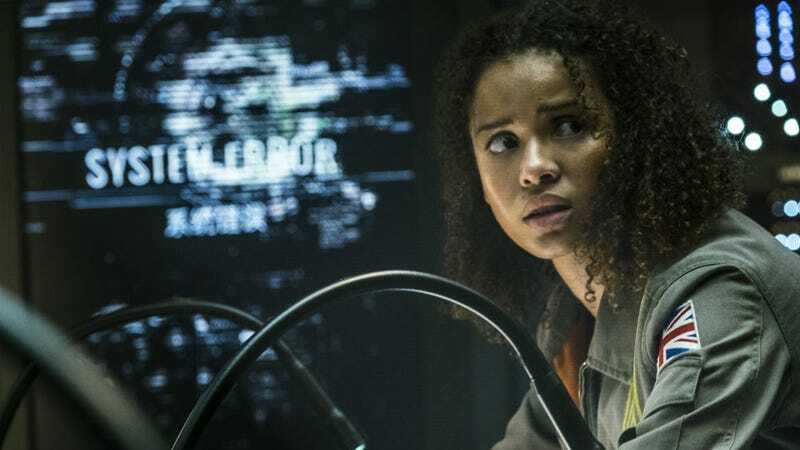 It’s impossible to say definitively until the creators speak up, but The Cloverfield Paradox certainly offers plenty of clues for fans to discuss. What did we miss? What are your theories? Discuss them below.